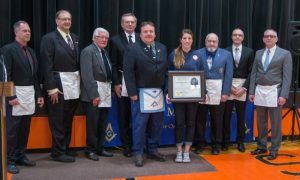 In a May 11th ceremony held at her Remsen hometown high school, representatives of the Grand Lodge of Free and Accepted Masons of New York and members of Remsen Lodge bestowed the fraternity’s DeWitt Clinton Award on Olympian Erin Hamlin. Photo identifications left to right in image: Bro.Bill Conners,R.W Roger Frank, Bro.Les Porter ,Bro.Richard Sack,,W.Shawn Murphy, Erin Hamlin,R.W Allen Jones. W. Jason Champion. and Bro. Jeff Serfreit, not shown Sir Knight Tom Loughlin Jr. PC.